Now that a long season has wrapped up, we fantasy football enthusiasts are left staring into the abyss of a seven-month offseason. Fortunately there are several oases along the way, including the free agent frenzy, the NFL draft, and the raucous week when New Yorkers eat peyote and talk themselves out of Kyler Murray because size matters in New York. The first stops on our long strange trip, however, are best-ball drafts – which at this stage are loosely educated guesses about who receives enough opportunity to produce fantasy points. We began our loose education last week with underrated passers. Let’s continue with a few quarterbacks who have inflated reputations, and traditional metrics that don’t properly reflect worrisome underlying factors. In English: here are a few bust candidates. Last year’s third-highest-scoring fantasy quarterback, Roethlisberger’s reputation is likely to be overinflated this offseason, despite the steady stream of drama emanating from the Steel City. Whether he’s worth investing in, amid what is potentially the deepest pool of fantasy passers, is another story entirely. Roethlisberger’s 2018 NFL passer rating was a nondescript 15th-best, whereas the PFF version — which offers a truer picture of performance — ranked him 27th. No quarterback had a larger negative ranking differential than his 12-spot decline. The soon-to-be 37-year-old Steelers passer turned in the best fantasy season of his career by averaging over 22 points per game and pulling off the rare feat — for him — of starting all 16 contests. Anyone silly enough to take this durability as a sign of what’s to come is either being irrationally optimistic about big-boned Bens, or they eschew the TB12 Method for the somewhat-less-stringent BR7 Plan. Whether or not Roethlisberger turns in his rocky road for avocado, it’s doubtful he again throws the most passes of his career (by 22 attempts). The Steelers are unlikely to repeat as the league’s pass-heaviest situation-neutral offense (65%), which was up from the seventh-most pass-heavy unit in 2017 (60%). Roethlisberger took the most dropbacks of his career but finished 13th in fantasy points per dropback. Any further dips in efficiency or – especially – in pass volume, and his fantasy output will plummet. 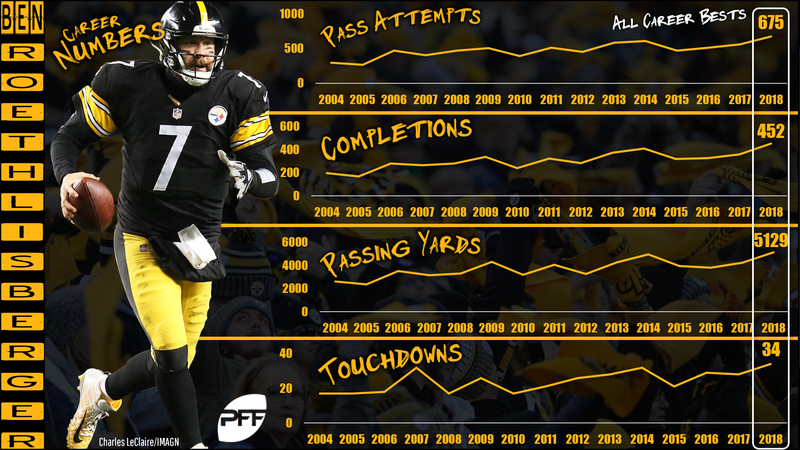 Roethlisberger probably won’t again match career highs in touchdown passes and rushing scores. His adjusted completion percentage stunk (28th of 38 passers), as did his deep-ball accuracy rate (27th of 33 passers). He wilted under pressure, registering the 27th-best passer rating while feeling heat, despite the quickest “time to throw” in the NFL. He earned his worst passing grade since 2006 — the second season of his career. While it’s legitimate to question if Roethlisberger can hold together physically for most of another season or if his mentality allows him to navigate the offseason without more retirement talk, the largest issue is that Pittsburgh’s offensive situation is more tenuous than at any point in recent memory. Le’Veon Bell is leaving town and Antonio Brown recently asked out as well. It is by no means an offense bereft of talent – JuJu Smith-Schuster is a rocket ship – but expecting the status quo for Roethlisberger’s fantasy performance in 2019 is foolish. When it comes to drafting Wilson, it feels strange to recommend caution. The man is an assassin. The only reason Pete Carroll and company have found success while deploying archaic offenses the last handful of years is Wilson continually bails their butts out. Last season was his most heroic work yet. Wilson essentially dragged a car with no wheels across the playoffs line, as Brian Schottenheimer filled the trunk with rocks. Only Drew Brees had a higher PFF passer rating than Wilson. Brees also barely beat Wilson out for the league’s highest passer rating on deep balls. Wilson posted an 11-to-1 touchdown-to-interception ratio on play action, and despite facing the fourth-highest pressure rate, he ranked fourth-best in passer rating while feeling heat. He also excelled with a clean pocket (third-highest passer rating). Wilson accomplished it all with a middling-to-poor offensive line, a paper-thin receiver group, and without a pass-catching tight end or running back in sight. Unfortunately for fantasy investors, even Wilson’s otherworldly efficiency only mitigated his coaches’ suboptimal approach. He registered the fifth-highest point-per-dropback rate, but only the 13th-most points per game. After incrementally increasing his pass attempts every season during a six-year career, Schottenheimer’s arrival cratered them in Wilson’s seventh season. There is only so much a fantasy quarterback can do while throwing the 32nd-most passes per game, even with a ridiculous touchdown rate. Wilson threw for a score on 8.2% of passes. It was, by far, his highest single-season touchdown rate, and it dwarfed what was an already-strong 5.7% career mark. 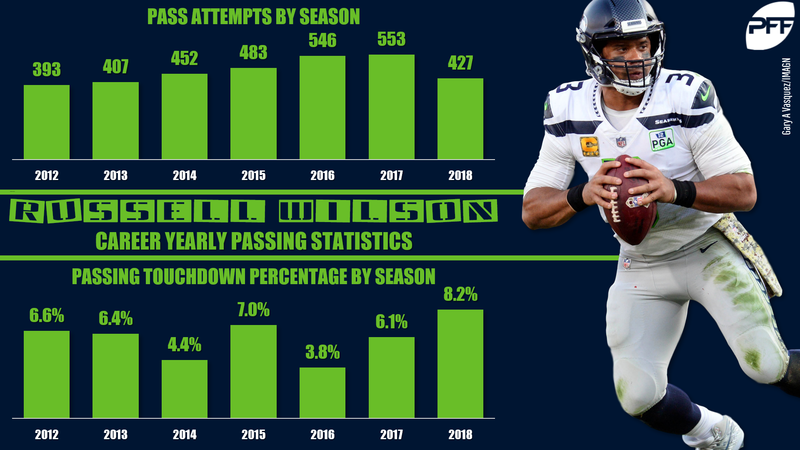 As dynamic as he is, however, Wilson will not match – or likely come close – to an 8.2% touchdown rate in 2019. As in-sync as he and Tyler Lockett are, they will not reproduce a perfect passer rating on 65 targets (bulging-eyes emoji). There will be unavoidable regression in many of Wilson’s rate stats next season. While this can sometimes be overcome when regressing from such a high starting point, there is no sign the volume of opportunity will rise to support consistent fantasy utility. The Seahawks operate a slow-paced offense with a league-high 53% situation-neutral run rate. Their games averaged the seventh-fewest combined plays under Schottenheimer’s reign last year. Wilson is not a worthy seasonal fantasy league target at his likely cost, unless something changes at the coaching level. Seattle surprised pretty much everyone by making the playoffs with what was deemed in August to be a talent-deficient roster. They fooled themselves and a few mouth-breathing pundits into believing their method of offense is optimal. Expecting them to change now is like expecting a post-Super-Bowl holiday. Everyone wants it except the clowns in charge. Many would consider Trubisky’s first full season as Bears starting quarterback a success, particularly from a fantasy football angle. He scored the 15th-most total points and the 12th most on a per-game basis. He supplemented that production with his legs, accruing 22% of his fantasy output on the ground – the ninth-highest rate among 38 qualifying quarterbacks. At least for now, we can expect a good portion of those points to remain in his bag of tricks. Coming off a forgettable rookie season, during which Trubisky was saddled with a caveman head coach and a persistently underwhelming offensive coordinator (sorry, Jets fans), it was impossible not to notice the strides taken by 2017’s second overall draft pick. After all, Trubisky still has started only 40 games between college and the NFL. We should probably resist the urge to expect too much, too soon – or at least refrain from unleashing incendiary tweets. However, maintaining realistic expectations does not mean ignoring troublesome gaps in perceived value and actual performance. 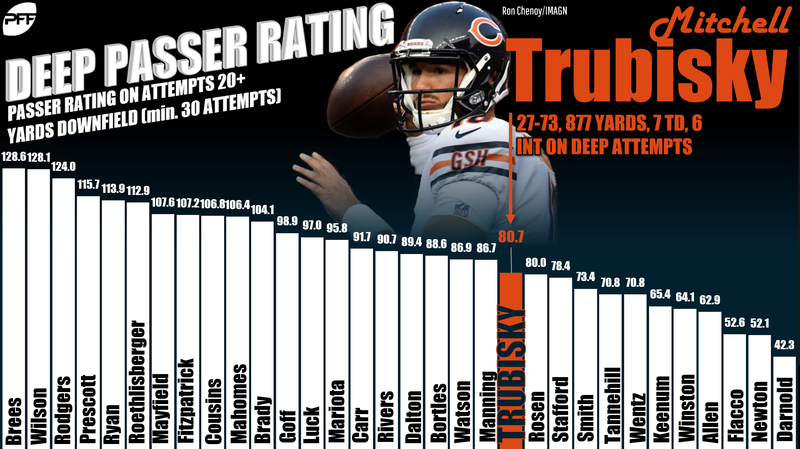 While Trubisky’s NFL passer rating was far from alarming (17th of 38 passers), he had the third-largest negative ranking gap between it and his PFF passer rating (24th). It was narrow, however, compared to the cavernous gulf between his NFL passer rating and his PFF passing grade – 36th out of 38 quarterbacks. Trubisky benefitted from the Bears crawling from the least pass-heavy offense during one-score games (50%), to the 24th (55%). There is room for growth there, and in overall play volume (63.3 per game, 14th). To realize it, not only will Chicago need to pass more, their pace needs to pick up from the sixth-slowest during neutral situations. Does Matt Nagy have the sort of trust in Trubisky to allow it to happen? Much of what occurred last year doesn’t argue for it, at least on the surface. Trubisky ranked 33 out of 38 passers in adjusted completion percentage. Despite the second-highest rate of chucking it 20-plus-yards downfield (16.8% of dropbacks), he underwhelmed on deep passes — ranking 21st in passer rating and 25th in accuracy rate. All signs weren’t bad, however. Inconsistent results in his passer rating while pressured (12th-best), versus with a clean pocket (21st), points to an inexperienced quarterback getting his feet wet in a new system. While we’d normally expect a harsh regression in touchdown rate due to 2018 (5.5%) placing well above his prior mark (2.1%), the rookie year number can be safely set aside considering his circumstances. Trubisky remains a wild card whose fantasy finish was augmented by a soft schedule, a healthy chunk of rushing success, and a three-game early-season stretch that accounted for 49% of his points in 21% of his contests. While cherry-picking games can be dicey, Trubisky’s fantasy production did fall off. This decline and his contradictory metrics could be warning signs. Depending on his offseason cost, they could also help create a buying opportunity — placing him in the later rounds of deep fantasy formats or in two-QB league territory.